Public authorities are the repository of information which the citizen have right to have under the Right to Information Act, 2005. As defined in the Act, a “ Public authority ” is any authority or body or institution of self government established or constituted by or under the Constitution; or by any other law made by the Parliament or a State Legislature; or by notification issued or order made by the Central Government or a State Government. Bodies owned, controlled or substantially financed by the Central Government substantially financed by the Central Government or State Government also fall within the definition of public authority. The financing of the body or the NGO by the Government may be direct or indirect. A citizen has a right to seek such information from a public authority which is held by the public authority or which held under its control. This right includes inspection on work, documents and records; taking notes, extracts or certified copies of documents or records; and taking certified samples of material held by the public authority or held under control of the public authority. Sub-section (1) of section 8 and section 9 of the Act enumerate the types of information which is exempt from disclosure. Sub-Section (2) of section8, however, provides that information exempted under sub-section (1) or exempted under the Official Secrets Act, 1923 can be discloses if public interest in disclosure overweighs the harm to the protected interest. Further, sub-section (3) of section 8 provides that information exempt from disclosure under sub- section (1), exempted as provided in clauses (a), © and (i) thereof, would cease to be exempted after 20 years from the date of occurrence of the related event etc. 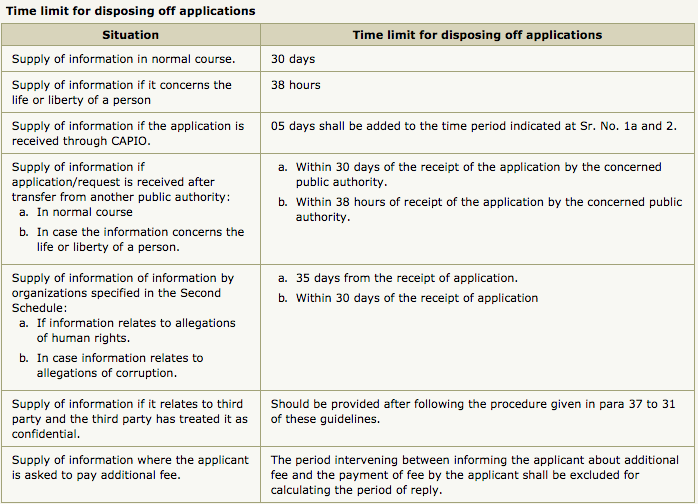 The Act requires that except in some special circumstances, decision on an application for information should be given within 30 days of the receipt of the request. Where the information sought for concerns the life or liberty of a person, the same should be provided within forty-eight hours of the receipt of the request. If the decision on the request for information is not given within the prescribed period. It is deemed that the request has been refused. If is pertinent to note that if a public authority fails to comply with the specified time limit, the information to the concerned applicant would have to be provided free of charge. The RTI Act has over-riding effect vis-a-vis other laws in as much as the provisions of the RTI Act would have effect notwithstanding anything inconsistent therewith contained in the Official Secrets Act, 1923, and any other law for the time being in force or in any instrument having effect by virtue of any law other than the RTI Act. Proper management of records is of utmost importance for effective implementation of the provisions of the Act. A public authority should, therefore, maintain all its records properly. It should ensure that the records are duly catalogued and indexed in such a manner and from that it may facilitate the right to information. The public authority should computerize all its records which are appropriate to be computerized, Record so computerized should be connected though a network on different systems so that access to such records is facilitated. Besides the categories of information enumerated above, the Government may prescribe other categories of information to be published by any public authority. It need be stressed that publication of the information as referred to above is not optional. It is a statutory requirement which every public authority is bound to meet. Another important point to note is that it is not sufficient to publish the above information once. The public authority is obliged to update such information every year. It is advisable that, as far as possible, the information should be updated as and when any development takes place. Particularly, in case of publication on the internet, the information should be kept updated all the time. The public authority should widely disseminate the information. Dissemination should be done in such form and manner which is easily accessible to the public. It may be done through notice boards, newspapers, public announcements, media broadcast, the internet or nay other means. The public authority should take into consideration the cost effectiveness, local language and most effective method of communication in the local area while disseminating the information. Public authorities formulate policies and take various decisions from time to time. As provided in the Act, while formulating important policies or announcing the decisions affecting the public, the public authority should publish all relevant facts about such policies and decisions for the information of public at large. The public authorities take various administrative and quasi- judicial decisions which affect the interests of certain persons. It is mandatory for the concerned public authority to provide reasons for such decisions to the affected persons. It may be done by using appropriate mode of communication. Every public authority is required to designate Public Information Officers in all the administrative units or offices under it. The public authorities should also designate the First Appellate Authorities and publish the details thereof along with the details of the Public Information Officers. Every public authority is also required to designate Assistant Public Information Officers at each sub-divisional level. The Government has decided that Central Assistant Public Information Officers (CAPIOs) appointed by the Department of posts would act as CAPIOs for all the public authorities under the Government of India. According to the Right to Information (Regulation of Fee and Cost) Rules, 2005 as amended by the Right to Information (Regulation of Fee and Cost) Rules, 2006, an applicant can make payment of fee in case or by demand draft or bankers cheque or India Postal Order payable to the Accounts Officer of the public authority. The public authority should ensure that payment by any of the above modes is not denied or the applicant is not compelled to draw IPO etc. in the name of any officer other than the Accounts Officer. If any public authority does not have any Accounts Officer, an officer may be designated as such for the purpose of receiving fee under the RTI Act or rules made there under. The Act provides that if an application is made to a public authority requesting for an information, which is held by another public authority; or the subject matter of which is more closely connected with the functions of another public authority, the public authority, to which such application is made, shall transfer the application or relevant part of it to that other public authority within five days from the receipt of the application. The public authority should sensitise its officers about this provision of the Act lest the public authority is held responsible for delay. While deciding an appeal, the Central Information Commission, may require the concerned public authority to take such steps as may be necessary to secure compliance with the provisions of the Act. In this regard the Commission may pass an order to provide information to an applicant in a particular form; appoint a Public Information Officer; publish certain information or categories of information; make necessary changes to its practices in relation to the maintenance, management and destruction of records; enhance the provision of training for officials; provide an annual report as prepared in compliance with clause (b) subsection (1) of section 4.
any facts which indicate an effort by the public authorities to administer and implement the spirit and intention of the Act. Every public authority should send necessary material to its administrative Ministry/Department soon after the end of the year so that the Ministry/Department may incorporate the same in its report. If it appears to the Central Information Commission that a practice of the public authority in relation to the exercise of its functions under the Act does not conform with the provisions or spirit of the Act, it may give a recommendation to the authority specifying the steps ought to be taken for promoting such conformity. The concerned public authority should take necessary action to bring its practice in conformity with the Act. It is expected of each public authority that it would develop and organize educational programmes to advance the understanding of the public, in particular of disadvantaged communities, as to how to exercise the rights contemplated under the Act and ensure timely and effective dissemination of accurate information about their activities. Training of the Public Information Officers and other officers of a public authority is very important for meeting these expectations and effective implementation of the provisions of the Act. The public authorities should, therefore arrange for training or their officers designated as Public Information Officer/First Appellate Authority and other officer who are directly or indirectly involved in the implementation of the provisions of the Act.